DENVER -- You know the feeling: driving around and around in circles trying to find parking downtown that doesn't cost an arm and a leg. 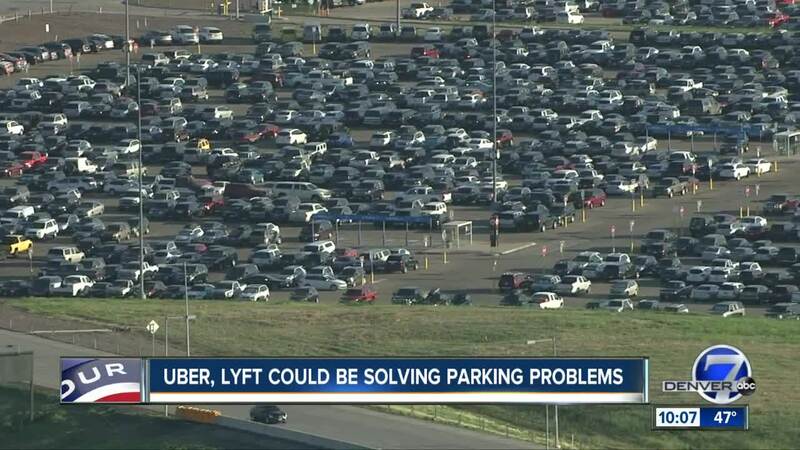 That is the reason a lot of people are taking Uber or Lyft instead of driving, and a new University of Colorado Denver study shows it could address some of our parking woes. "We’re from Greeley. We came down from the day just to enjoy it," said Jason Paws, who spent 45 minutes driving around downtown Denver looking for parking Wednesday. "You miss a spot that’s an actual decent price for parking, so it’s just a ring around the rosie kind of thing." Parking is such a pain that a new CU Denver study shows it ranks as the second reason people use Uber and Lyft (going out/drinking was ranked number one). Associate Professor of Civil Engineering Wes Marshall said his graduate student and the study's lead author, Alejandro Henao, actually worked as a Lyft and Uber driver to collect information from hundreds of real passengers. Their research found that more than a quarter of riders would have driven themselves and parked downtown if rideshares weren't an option. "So, when you think about how much parking is being consumed - the supply, you think you can almost reduce that parking by about that quarter," said Marshall. But Heather Burke, a spokeswoman for Denver Public Works, said the city has seen no sign of reduced parking demand downtown. "Denver Public works has not seen any kind of decrease in parking demand with the public surface lots that we manage as well as the garages," she said, adding that the city also hasn't seen demand decrease for street or metered parking. CU Denver's study points out there is evidence nationwide of parking revenue decline at airports and other venues, and the study concludes that cities might want to re-examine parking lots taking up valuable space in a vibrant downtown. "Walking past a lot of parking lots isn’t the most pleasant atmosphere, so you want to have more things that bring people to downtown, so the restaurants, event centers, that’s what brings people here, the parking is not what brings them here," said Marshall. "If you have the good things, people will get here and they’ll figure out a way to do it, and Uber and Lyft are just another of a suite of things people can use to get to a place like Denver." He said cities need to look a curb space for rideshare pick up and drop off instead of parking, as well as other infrastructure improvements to be less dependent on cars. “We wanted to understand how these new services, Uber and Lyft, are impacting a city in regards to how people shift travel behavior, overall congestion and changes in landscape,” said lead author Alejandro Henao, former PhD student at the University of Colorado Denver and current mobility researcher with the National Renewable Energy Laboratory (NREL). For the study, he teamed up with Wes Marshall, PhD, PE, associate professor in the College of Engineering, Design and Computing. Last fall, the pair published a study in the journal of Transportation examining how rideshare services impact the transportation system. Their research found ride-hailing increased deadhead-ing (drivers circulating around without passengers), congestion and vehicle miles traveled while luring passengers away from more sustainable travel options like walking, biking and public transportation. Parking, researchers realized, may be one upside.